VOCAL’s VoIP echo cancellation software solution includes acoustic echo cancellers and line echo cancellers. Our line echo cancellation software exceeds the ITU G.168 recommendation for echo control in digital networks and makes echo imperceptible to all participants in the communication and provides toll grade voice quality for VoIP applications. Please contact us to discuss your VoIP application requirements. VOCAL’s VoIP echo cancellation software is portable and easily customized to meet the needs of your system. Our VoIP software is optimized for execution on ANSI C and leading DSP architectures (TI, ADI, AMD, ARM, MIPS, CEVA, LSI Logic ZSP, etc.). Custom solutions are also available. Echo is a problem in VoIP networks where it inhibits the quality of communications. 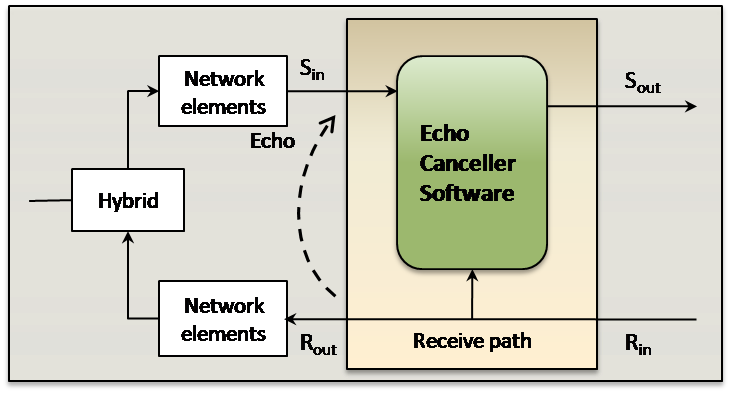 As such, it is important to use an echo canceller in a VoIP gateway to handle the echoes generated within the transmission path. VoIP gateways handle echoes in the transmission line, referred to as line echoes, which occur in the analog portions of the transmission path. Leakage occurs from the impedance mismatch between 4-to-2 line hybrid transformer and result in echoes. Although the digital portion of a VoIP network has no leakage and does not directly introduce echo, echo has become more of a problem for VoIP networks than national landline networks. VoIP networks have additional delays due to the encoding and decoding processes, including packetization, packet switching, and jitter buffer delays. The round-trip in VoIP networks can easily be on the order of 100ms. When the round-trip delay is 25ms or less, the echo is imperceptible such that the user cannot differentiate the speech and the returning echo as separate events. As the round-trip delay increases the more annoying the echo becomes. Thus, unlike national landline networks, VoIP, Satellite, and long distance transmission networks can produce echoes that are disturbing to users.